Nintendo of America and Nintendo of Europe just updated their Ocarina of Time 3D homepages – and it’s mostly a graphical overhaul (see what I did there?). The America page includes a brand new trailer, while the EU page has a whole bunch of screens. The EU one looks like it’s gone a little further in terms of layout and navigation – it includes the neat artwork we spotted on the JP site a few weeks back (unfortunately the neat 3D effect isn’t working for me – how about the rest of you?) – but it doesn’t have the trailer (yet! ), so its content isn’t quite as exciting. I really love how the sites incorporate the storybook background of the American boxart, too. Check after the jump for the shots we haven’t posted here yet. 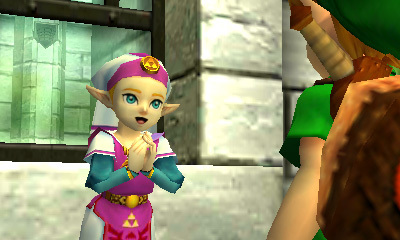 You can also view our full gallery of Ocarina of Time 3D screenshots by clicking here.